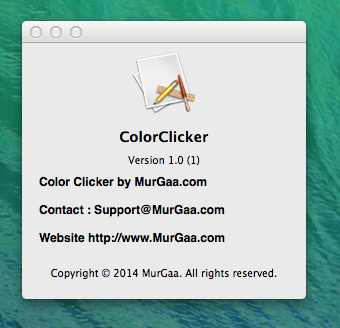 Find Color and Click the Color or at another Screen Location with Color Clicker for Mac. In built Color Detector Allows you to Detect Color and Pick Color on Screen with Configurable Keyboard Shortcut. The Color Clicker runs on Apple’s Macintosh 10.6 and later versions of Mac including 10.7, 10.8 and even on latest 10.9. The given below screenshot of Color Clicker has been captured on Mavericks. Note that there are 3 different configurable keyboard shortcuts which allow you to Pick Screen Color, Pick a Fixed Screen Location to Click and to Start the Color Search. The Color Clicker is detects Color around current Mouse Cursor Position and as configured clicks on the found Color or at a configurable Fixed Screen Location. The Move Cursor with Search slows down the Color detection process, but displays what the Color Clicker is doing on your Mac Screen. As evident from the screenshot above, you can even enable the option to move Mouse Cursor back to original Screen Location after the completion of Color Finding and Mouse Clicking procedure. Whenever you want to Find and Click any Screen location identified by a specific Color, all you need to do is tell Color Clicker the Color to find on Screen and tell the area around Mouse Cursor to search for. In the Main Screen of Color Clicker, you can define the Screen Area to search for in terms of Pixels. 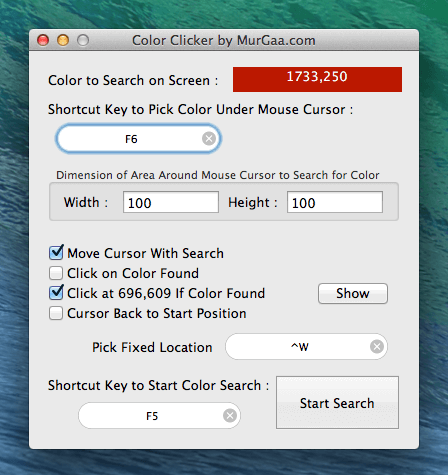 The first screenshot displays that the keyboard shortcut F6 has been configured to work as Color Detector and Pick Color under Mouse Cursor. Another Keyboard Shortcut i.e. F5 has been configured to start the Color Search and Mouse Clicking Procedure. The Mouse Clicker presented here allows you to Click at Fixed Location / Point on Screen with a Keyboard Shortcut. In Total 6 Fixed Points can be assigned in the software. By default only 3 Mouse Click Locations are available and you can Expand the Software to view / configure all the 6 points on your Screen to be Clicked with separate Keyboard Shortcuts. Do have a look at the given below Screenshot which displays the Main Screen of this Fixed Point Mouse Clicker. Note that in order to select a fixed point on the Screen, all you need to do is to Click a Button and then Click on the desired Fixed Point on the Screen. Every Mouse Click Location is identified by X and Y Co-Ordinate and they are Displayed in a Read Only Edit Box. Note in the above Screenshot that 3 Separate Fixed Points have been Configured and 3 different Keyboard Shortcuts are configured. Also note that there is configurable option for each Keyboard Shortcut to whether bring the Mouse Cursor back to the Original Location or leave it at the Fixed Point on the Screen. 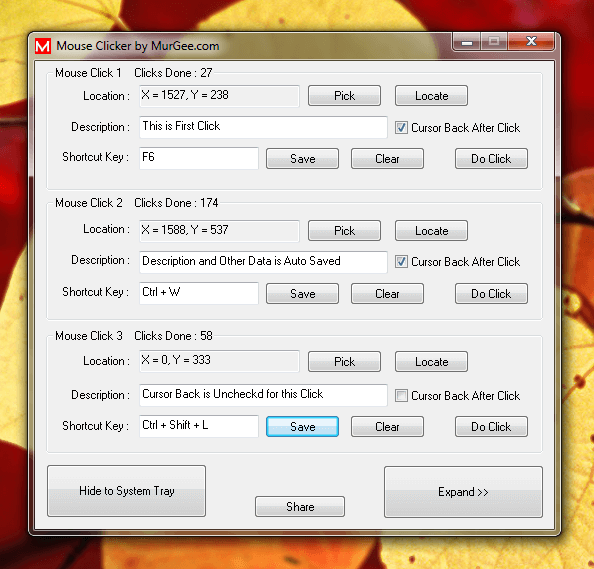 The Title of Every Mouse Click displays number of Clicks done by this Fixed Point Clicker so that you can identify number of Clicks done with every Keyboard Shortcut. 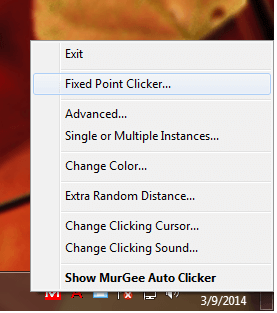 This Mouse Clicker to Click at Fixed Points on the Screen is included in Auto Clicker. The above Screenshot displays How to Launch Fixed Point Clicker from the System Tray Menu. Once you have Configured the Fixed Screen Points & Keyboard Shortcuts, you can hide the Main Window of the Mouse Clicker to the Notification Icon Area or so called System Tray. In case you would like to configure more than 3 Keyboard Shortcuts, do click on the Expand button to view / configure another 3 Mouse Clicks at Fixed Screen Locations. This Fixed Point Mouse Clicker performs a single Left Mouse Click whenever the Configured Keyboard Shortcut is pressed. 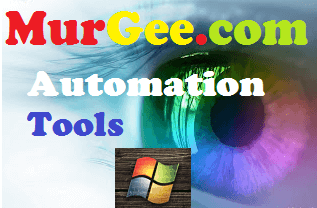 There is no Time Delay between pressing of the Keyboard Shortcut and Automated Mouse Click performed by this Mouse Automation Software Utility. Effectively if you press the Keyboard Shortcut Key Assigned and do not Release the Keyboard Shortcut Key, this Mouse Clicker will keep on Clicking at the Fixed Point. In case you want to add a Fixed / Random Time Delay between Mouse Clicks, the How to Click Faster post describes how you can Control the Mouse Clicking Speed by adding a Time Delay between Mouse Clicks. In order to remember the purpose of any given Mouse Click, do add a Short Description for every Click. In case you have Expanded the Software and Assigned Keyboard Shortcuts for 4th, 5th and 6th Mouse Clicks, then do keep this Fixed Point Clicker in Expanded Mode so that you can easily view and use Keyboard Shortcuts to do Automatically automate Mouse Click at correct Fixed Point on the Screen. Clicking Mouse with your fingers requires you to keep on pressing the Mouse Button rapidly and persistently. Only constant practice can increase your Mouse Clicking speed. This post provides ways in which people all across the globe click faster than ever. Multiple ways are presented in this post describing how you can click faster than ever. Whether you want to click super fast in Minecraft or any other online Game like Cookie Clicker, the techniques defined here work irrespective of the Operating System you use. Let’s start with a Software Solution which is the Most easiest way to Click Faster at a Constant Speed and is really easy to implement and use. The above Screenshot displays a simple Software Application which is used to click at a really fast pace. Note closely that the speed at which Mouse Clicking is to be done is configurable in the software as displayed by 3 different Mouse Clicking Records added in the software. The Above Application does not require you to practice for long hours and put stress on your fingers. As it is a programmed application, it has in built capability to Click Mouse quickly and persistently. 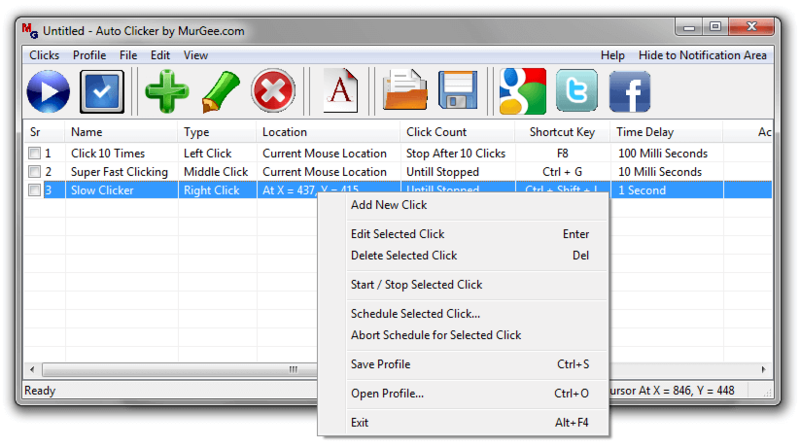 The above Fast Mouse Clicking Application is called as Auto Clicker and is designed for Windows Operating Systems. Apart from providing the capability of Clicking Mouse Faster and Faster, it does provides lots of other visual and audible alerts and Mouse Clicking Configurable Options. Just like the first software application presented in this post to Click Faster, the Above Screenshot is a Fast Mouse Clicker for Apple’s Macintosh Computers. You can download the Fast Clicker and try it for Free on your 10.6, 10.7. 108. or even on 10.9 Mac Mini, Apple Notebook, Apple Macbook Pro, MacBook Air or any other Mac. The Application presented above is a really Simple Application in which all you need to define is a Keyboard Shortcut to Start / Stop Mouse Clicking and the Speed at which the Software Must Click. The Mouse Clicking Speed of the above Software Application is Persistent and Accurate. The Help Buttons provided on the Software helps you understand parameter values and their corresponding effect. 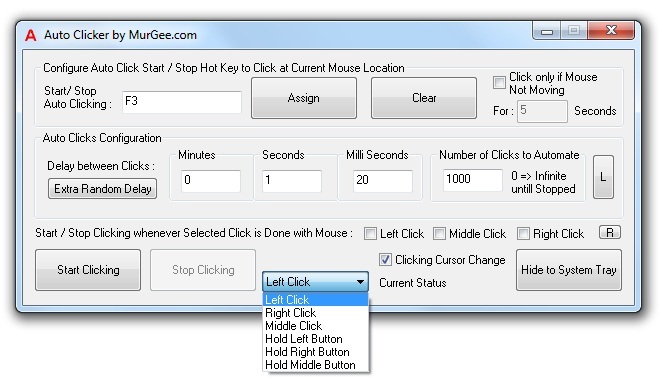 Another way to Click Mouse Faster is to use Keyboard to Click Mouse with MouseKeys. 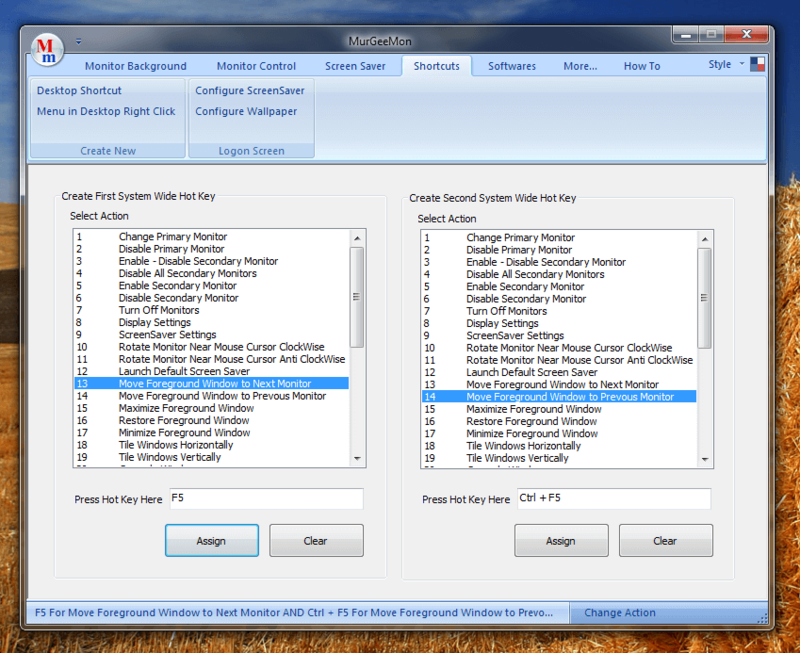 You need to Enable MouseKeys from the Windows Control Panel’s Ease of Access Center as Displayed in the Screenshot above. The MouseKeys functionality is built into Windows so you do not need any other software to download or install. Once you have enabled the MouseKeys, you will notice a Mouse Icon in the Notification Area as displayed in the Screenshot above as well. Once you have Enabled the MouseKeys, the speed at which you can Click depends on how fast you can press and release the button labelled 5, you can also Move Mouse Cursor with 4,8,6 and 2 Keys on your NumPad. The Final Solution to Click Faster with Physical Mouse is to Practice pressing and releasing the Mouse Click Button on your Physical Mouse. Note in the above Screenshot that the Left Mouse Button has been pressed more as compared to the Left Mouse Button. Yes this is a tedious process and requires lots of efforts on your part. However once you have practiced pressing and releasing the Mouse Button at a rapid pace, you will be able to Click Faster than before. In case you still want to beat the Game you are playing and want to do Mouse Click at a Steadily Fast Rate, you can use the Auto Clicker. 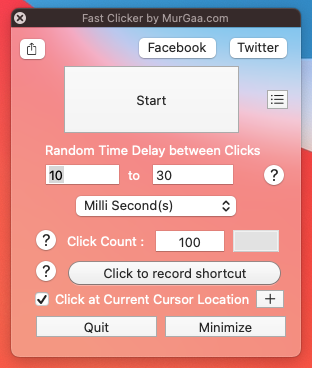 It Allows you to simulate human behavior by simulating random time delay between consecutive clicks, allows you to quickly configure mouse clicking parameters, allows to add deviation from fixed point clicking, lets you start / stop mouse clicking with a single keyboard shortcut key and much more. All of the above methods to click faster with or without extra software provides ways to click Mouse Faster at the Current Mouse Cursor Location. Games like Cookie Clicker, Minecraft, Runescape, etc are good and easy ways to practice fast mouse clicking. There are other type of Software Applications as described in the Fast Clicker post which describes other ways in which you can do Automated Fast Mouse Clicking. 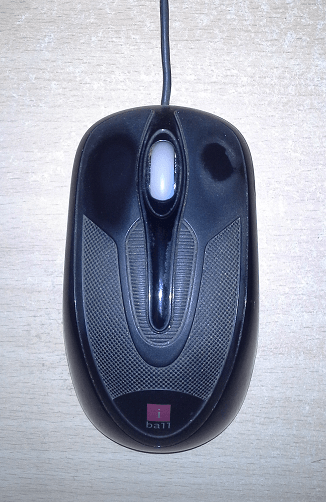 Other ways to automate Fast Mouse Clicking according to a Script, Recording Mouse Clicks and then Playing them back, etc are the ways in which other Mouse Clicking Applications help to achieve steady / persistent Mouse Clicking. The Invisible Wall for Mouse Movement in a Dual or Multiple Monitor Windows Computer restricts Mouse Movements. The Dual Monitor Software presented in this post presents an easy and quick workaround to Move across Monitors with a Keyboard Shortcut. All you need to Move Across Monitors with this Dual Monitor Software is to press the Keyboard Shortcut which will re-position / relocate Mouse Cursor to other Monitor. Yes this Simple Solution allows you to Skip the Invisible Wall which Microsoft imposes for every Monitor. The best part of this Shortcut Key to move Mouse Cursor Across Dual or Multiple Monitors is you can move the Mouse Cursor with Keyboard Shortcut without worrying for Different Monitor Resolutions or Layouts (i.e. Landscape or Portrait Mode). 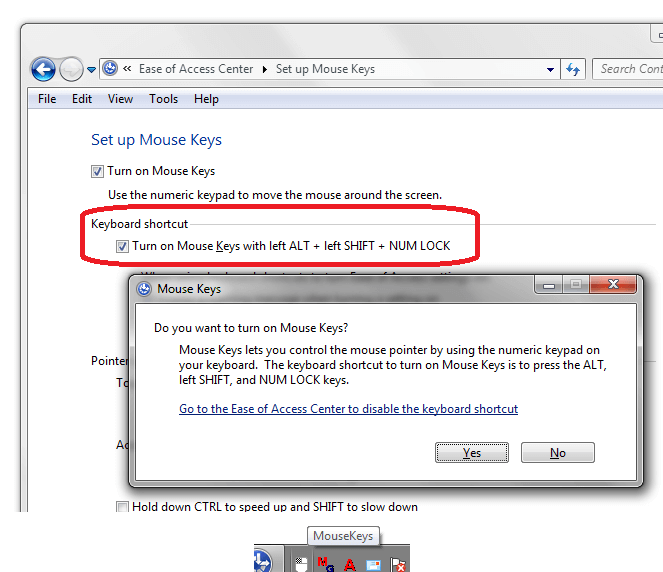 In the Above Screenshot the Keyboard Shortcut F7 has been Assigned to Move Mouse Cursor Across Invisible Wall of Dual or Multiple Monitor Windows Computer. Yes the Keyboard Shortcut is configurable and after pressing the Keyboard Shortcut in the White Box provided, you need to click on the button labelled Assign in order to save the Keyboard Shortcut and let it Move Mouse Across the Invisible Wall of Monitors. The Dual Monitor Software presented above is named as MurGeeMon and provides plenty of other useful features making it easy to use Dual or Multiple Monitor Windows Computers. 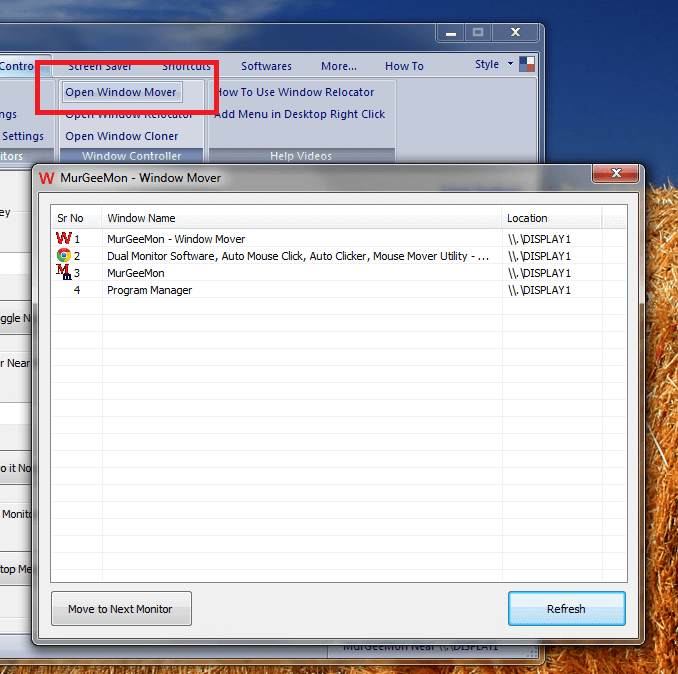 Another way to beat the Invisible Wall of Dual or Multiple Monitor Windows Computer is to Move any Application Window to the Next Monitor with Window Mover of MurGeeMon as displayed in the screenshot above. The Window Mover displays Program Windows along with the name of Monitor in which they are positioned. As with the above solution to move around without struggling with Invisible Wall of Dual or Multiple Monitor Windows Computer, this Window Mover Solution also helps you to skip the Invisible Wall of Dual or Multiple Monitor Windows PC while moving Application Windows to other Monitors with Same or Different Resolution / Monitor Layout. While the Window Mover does Displays the Application Window Title and the Monitor Name on which the Application Window is present, you can even save few more Clicks to do the same task with Keyboard Shortcut as displayed in the Screenshot above. Yes this Configurable Keyboard Shortcut lets to skip the Invisible Wall or Dual or Multiple Monitors and move any Application Window to Next or Previous Monitor in the list of Multiple Monitors connected to your Windows Computer in Extended Mode. Do Visit the MurGeeMon home page to view other features and Download the Software on your Windows Computer. Although this Dual Monitor Software works on Windows XP onward Computers, Windows 7, Windows 8 and Windows 8.1 users of this Software Utility do get few extra keyboard shortcuts. The Extra Keyboard Shortcuts lets you switch in between various Modes of Dual or Multiple Monitors including the Clone Mode, Extended Mode and few other Modes. With the features presented above, you can beat the Invisible Wall of Multiple Monitors and save yourself efforts to find out space to navigate from one Monitor to the other Monitor. Screen of a Windows Computer is totally controllable using Windows Control Panel. Yes the Windows Control Panel allows you to control what colors and how content is displayed on your Screen by Microsoft Windows. The Display Settings from Windows Control Panel provides major control over display of everything on your Windows Computer. This Post talks about controlling Display Color, Resolution, Monitor Settings, etc. The Example Windows Computer taken in this post is a Windows 7 Computer and the description and other settings are almost the same on Windows Vista as well. Microsoft Windows 8 has taken a big step ahead and another post will describe how to control Display Settings in a Windows 8 or Windows 8.1 Computer. Let’s Start by doing a Right Click on Desktop and Invoke the Right Click menu of Desktop. Note that there is are Menu Options to Launch Screen Resolution, Gadgets and Personalize. The Screen Resolution Menu Option will open up the Screen Resolution Page of Control Panel. 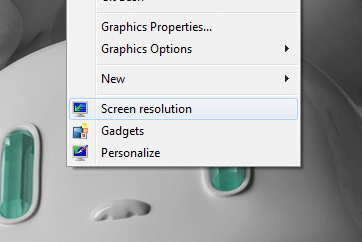 Yes you can Launch the Screen Resolution Page in many other ways, however invoking Screen Resolution from Right Click of Desktop Menu is the Simplest option. The Screen Resolution page of Control Panel allows you to Control the Display Resolution and hence affects how your Screen Display Appears. Long Time back when Windows XP was the best Windows Operating System, Computer Engineers often had to struggle with Display Drivers and assigning appropriate Display Resolution. Now a days with Windows 7, Windows 8, and Windows 8.1, normally the Display Resolution is assigned by the Windows Operating System Installer already and is the best Display Resolution for the Screen connected. Even if you do have Multiple Screens Connected to your Windows Computer, this Screen Resolution page of Windows Control Panel is the page where you can control what does the screen of other connected monitors display. The post Second Screen in Windows 8 talks briefly how you can Control Dual Monitors on a Windows 8 Computer. 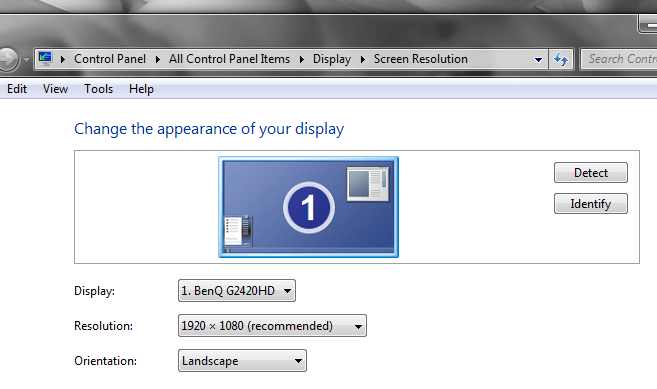 As evident from the Screenshot above, you can view or change Display Resolution, Orientation and even detect the Monitor(s) connected to your Windows Computer. The Personalization page of Windows Control Panel allows you to change Desktop Background, Color of Windows , Transparency of Windows, Screen Saver, etc. Few Image Files for Desktop Background are provided by Microsoft in every Windows Operating System and you can even download Picture Files called as Wallpapers and assign them to Desktop Background Image. 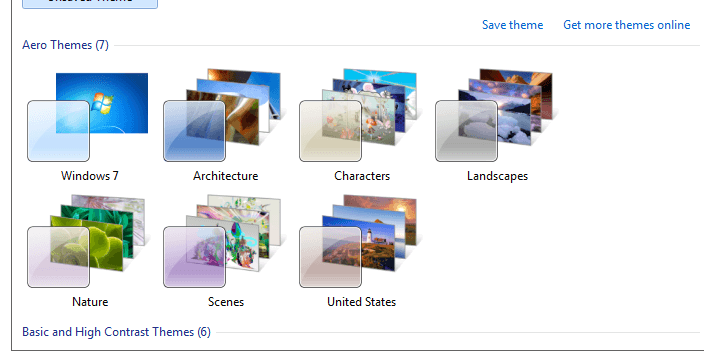 Windows 8 provides easy way to Assign Different Wallpapers on to different Screens / Monitors. In case you do have Dual Monitors Connected to your Windows 7 Computer, you can use the Dual Monitor Software to assign different Wallpapers to Dual Monitors. The availability of LCD Monitors with Bigger Screen Resolution allows everybody to have a Bigger Monitor as Compared to having Dual Monitors an easy way to manage Large Content on Display. 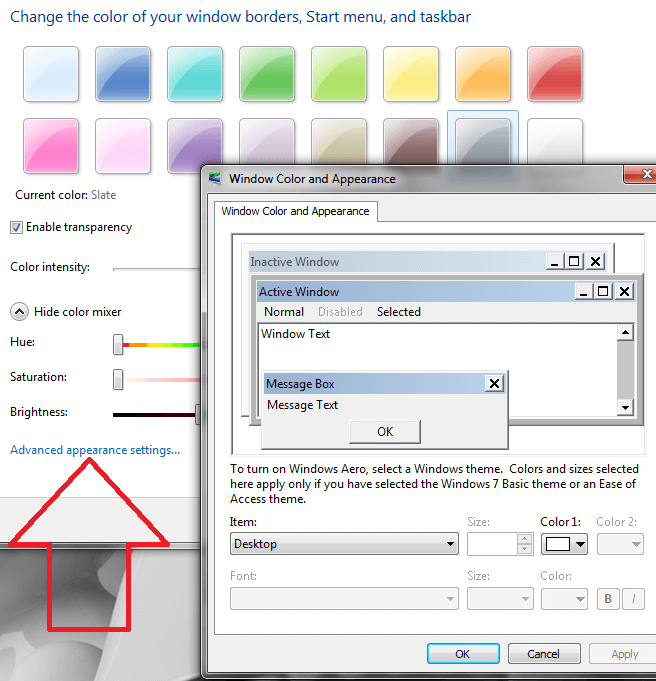 The Window Color Option is an important aspect and settings in Window Color affect all Application Windows. The Screenshot above displays the Window Color Page of Windows Control Panel where you can control the color of Application Windows, Enable / Disable Transparency of Application Windows and fully control the Colors of Application Windows. Software Applications like Color Change Detector as used in Auto Color Clicker allows you to create a Screen Sensor with which you can Monitor Screen Color Changes and launch Applications or Open Document Files. 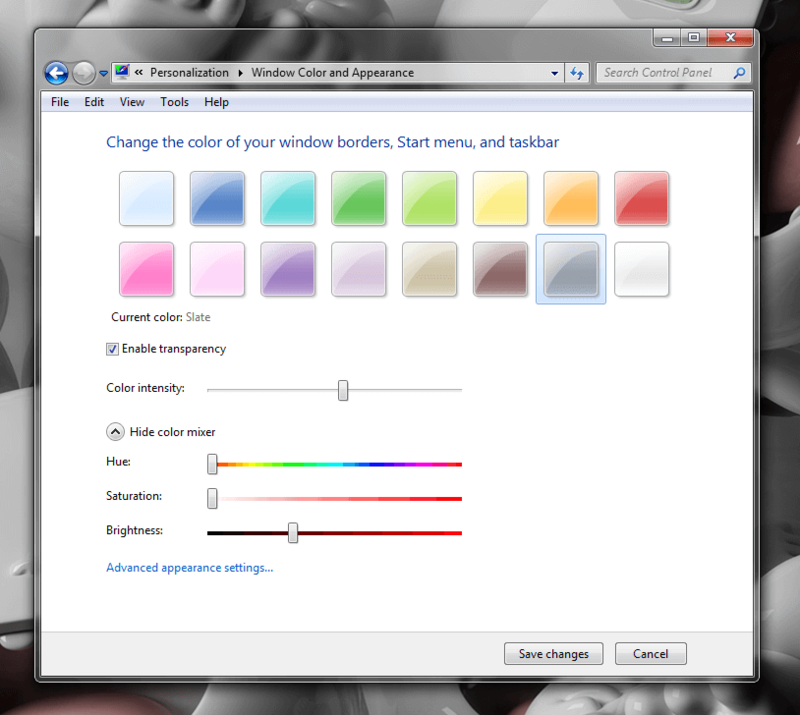 The Screen Color Changes done in the Window Color and Appearance Control Panel option are applicable to Window borders, Start menu and taskbar. The above Screenshot displays Advanced appearance Settings in which you can control color and font of specific display item. In case you do have specific requirement then this advanced setting of appearance can give you specific color. In order to change color / font of let’s say how Message Box appear, click on the Message Box and then choose the appropriate Color and Font. The Font option is enabled as and when it is applicable for the selected display item. All the above Control Panel features together gives you the Screen Color as you desire. In case you want to change Screen Color, Desktop Background and other Screen Appearance settings, then selection of a different theme can be an easy way to change the overall look of your Windows Computer. 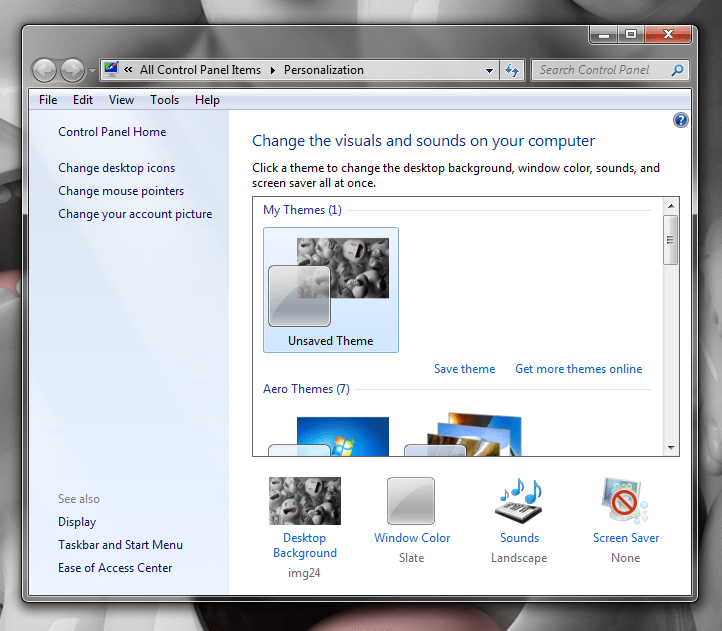 As displayed in the above Personalization tab of Windows Control Panel, you can connect to Internet and Download more themes from Internet or use any of the pre-installed themes to change the Screen Color and other Settings of your Windows PC. Find out the best Software Downloads, for Windows 8.1, Windows 8, and other Operating Systems. You can also Find Software Apps for Android, Mac OS X and even Linux. Windows 8.1 or Windows Blue is New Microsoft Windows Operating System ?